This is a photograph showing Nicholas B. Klaine who was born in Bordentown, New Jersey, on February 5, 1839. He came with his parents to Rock Island, Illinois, in 1851, where he lived until 1859. He married Julia Kinkaid in August, 1859, and they moved to St. Louis, Missouri. In August 1862, Klaine enlisted in Company K, Tenth Missouri Cavalry. He was commissioned Second Lieutenant, commanded the company one year, and was mustered out in May, 1864. He went to Warrensburg, Mo., in 1865, and started publishing the Warrensburg Standard, which he continued for ten years. While in Warrensburg, he served both as City Clerk and City Councilman. In 1869-1870, Klaine represented Johnson County, Missouri, in the State Legislature and was Johnson County Supervisor of Registration in 1866. In November 1877, Klaine went to Dodge City, Kansas where he became the editor and proprietor of the Dodge City Times, a newspaper established on May 20, 1876. On January 23, 1883, he took charge of the Dodge City post office. Klaine served as Probate Judge of Ford County, Kansas, in 1879-80; City Treasurer of Dodge City in 1882, and Constable, City Treasurer and School Director. In 1886, Klaine built a hotel in Cimarron, Kansas at an investment of $15,000. With the completion of the first floor of the three-story brick structure, he launched the New West Echo, a Republican newspaper that ceased publication when Klaine left the region in 1902. The newspaper occupied the north half of the first floor of the hotel. Klaine sold the hotel in 1902 to the Luther family. The hotel still exists and is now called the Cimarron Hotel. This is a photograph showing Nicholas B. Klaine who was born in Bordentown, New Jersey, on February 5, 1839. He came with his parents to Rock Island, Illinois, in 1851, where he lived until 1859. He married Julia Kinkaid in August, 1859, and they moved to St. Louis, Missouri. In August 1862, Klaine enlisted in Company K, Tenth Missouri Cavalry. He was commissioned Second Lieutenant, commanded the company one year, and was mustered out in May, 1864. He went to Warrensburg, Mo., in 1865, and started publishing the Warrensburg Standard, which he continued for ten years. While in Warrensburg, he served both as City Clerk and City Councilman. In 1869-1870, Klaine represented Johnson County, Missouri, in the State Legislature and was Johnson County Supervisor of Registration in 1866. In November 1877, Klaine went to Dodge City, Kansas where he became the editor and proprietor of the Dodge City Times, a newspaper established on May 20, 1876. On January 23, 1883, he took charge of the Dodge City post office. 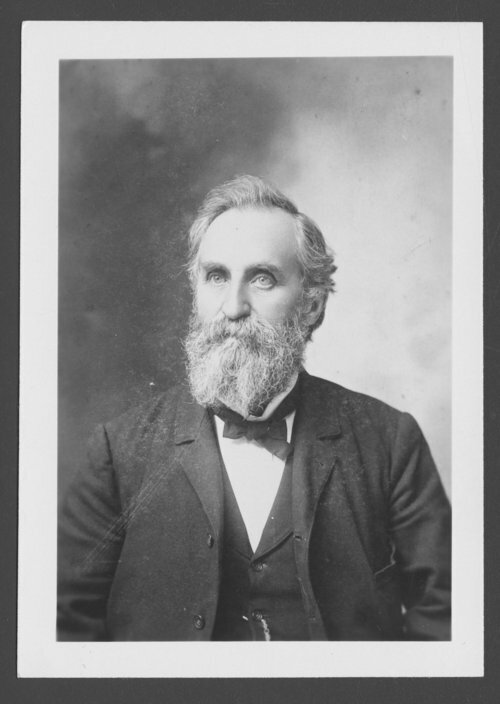 Klaine served as Probate Judge of Ford County, Kansas, in 1879-80; City Treasurer of Dodge City in 1882, and Constable, City Treasurer and School Director. In 1886, Klaine built a hotel in Cimarron, Kansas at an investment of $15,000. With the completion of the first floor of the three-story brick structure, he launched the New West Echo, a Republican newspaper that ceased publication when Klaine left the region in 1902. The newspaper occupied the north half of the first floor of the hotel. Klaine sold the hotel in 1902 to the Luther family. The hotel still exists and is now called the Cimarron Hotel.